Aarti is a result-oriented professional with six years of work experience in providing high quality recruitment, support and HR services. Her work experience spans internal recruitment in the fast paced IT and Banking industry in India, through to managing the end-to-end recruitment for both permanent and temporary job vacancies in the Government and the private sector in Canberra. Aarti’s experience has provided her with opportunities to work both as a recruitment consultant as well as a client and thus is well versed with the pressures of both. Aarti possesses a focused, customer-oriented approach with excellent client relationship management skills. 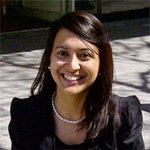 Aarti moved to Canberra in 2009 to pursue her postgraduate studies and holds a Masters of Human Resource Management from the University of Canberra.